Hostingformula currently switch to cheap vps server. Old hosting provider using cpanel and everything went fine . Almost perfect in migration process except one thing. Yes. I forgot if I enable cloudflare for this domain and the result is bad. Looping error caused by www mapping that set automatically by cloudflare kill this blog. 2. Visit cpanel, click Simple DNS setting and ‘delete’ any entry related to cloudflare (see picture above for example). How to test if the problem disappear? Problem left after this action is dns propagation. You can install vpn software like hotspotshield or related to try visit your blog / website again. 3. Use intodns to verify the dns change. If intodns told you right ip address then you’re on right track. 4. Patient. Other problem left is client dns. Since you can not force client to use google or opendns for resolve your new server the only option is be patient. A friend of mine that not seen for years contact me. He had problem with his school website. Headmaster give him order to take care their website that seem to abandoned by current holder. Every time they (school) contact him. No respond and no email. He ask me to see it and if possible solve it immediately. Update : if you’re in hurry then you can use Fiverr service that will do the job ($5 per site). Click here to see the service. After ask the website hosting representative we have clues where do we must start. Create official letter from school about domain ownership. The process itself is not straightforward as current holder respond to hosting company email and the phone but not respond to us. After a month the progress finally move to right direction. Current holder not paid for hosting fee and that’s the reason for my friend. Contact hosting company and finally they approve account moving and switching. Since the hosting company suspend the account for its late payment then the website is not accessible anymore and only display ‘account suspended’ message. My friend ask me if I can give him temporary place for their school. I agree to give him a space with exchange. I must do the transfer process myself. I like to see how to transfer joomla based website to vps. Fortunately my friend already download the backup file. Its tar.gz file (backup-11.15.2014_11-29-19_domain.tar.gz ). After copying the file to my laptop I initiate transfer using scp. the process depend on internet speed and file size. For my case, it took around 1 hour to upload 132MB of file. I use Easyengine that I use in previous post for host wordpress. Joomla also created with php and utilize mysql. So I choose php+mysql website. I use same VPS that powered by Vultr for WordPress. Time for extract backup file. Looks like this backup file created by my friend taken from cpanel backup wizard. I just need to find out where joomla files and its database located. Next step is move joomla folder found from previous step to easyengine folder. The configuration file located in configuration.php . Edit $user, $password and $db . Thats it. Try to reload it via web browser and everything load fine so far. My friend happy with the migration process. The load speed is incredible and they can add their content again and if they like it then they can make their own server with Vultr. Never use personal email address as contact, billing etc for school domain. Always use school email address. Beside this touch make everything official also prevent future problem like my friend case. If possible use the longest period for registering school domain. Yearly renewed domain is not suitable for a school. Its almost the end of year. Many offer came and out include hosting. My friend just have her hosting account expire and the reason why she not continue her hosting plan is cost. She got her hosting package last year for $10 (from facebook group). The package cover free domain + 12 month of hosting and when renewal process came she can afford it. Its $104 now. Ten times from previous invoice. She already knew it and try to find other solution to keep her blog alive. She already red my post about utilize vps. Her blog is using wordpress and she want to try it after she see my other blog that load blazing fast. I told her about Vultr and she could try it for cheapest package. I promise her to help the migration process in exchange she let me share the process for hostingformula.net reader (I won’t reveal domain name). Hope this useful for others. In general WordPress is PHP and MySQL application. To backup wordpress the step is quite simple. A reader send me an email. He ask about possibility of install FreeBSD 32 bit on VPS. He just confuse why Vultr not provide custom iso under 32 tab. He think Vultr not support it. I replied to him that he could test it himself. Upload iso file as usual and continue with installation. He not sure and ask me to try and if possible show the process in single post. Well, I just remember myself when first time I learn install Redhat 6. I loss 4 month of worrying and afraid if fail. In reality it took 2 days for install FreeBSD 4.7 ( one day for download iso and burn it to CD and second day for read installation manual and applied it). I think Vultr is great one. They provide very flexible infrastructure and if I want to back to FreeBSD 4 I can do that too. My student also free to experiment with their task only by using small 11 inch netbook. Remote to Vultr and free to test the configuration. Fast network and good CPU. FreeBSD 10.1 was released and I want to try install FreeBSD 10.1 32 bit for this experiment. Since I’ll have a lot of bandwidth I use DVD version for upload it to custom isos list. One of my reader shout me an email about his problem. He get free forex vps from his broker after he met required deposit amount but he got disappointed with the quality. Its low end vps that running Windows 2003 and restrict him on EA usage. He don’t know how his broker monitor his vps but when he try to use his VPS running EA for another broker the connection get worst and he got warning. He must utilize the server only for the broker who give him vps not for others. He already search for cheap forex vps but still not sure which one he must choose. Lightweight vps he ever try is not run anti virus and very minimal installation. Only Windows 2003 with built in IE browser. To many networking problem and maintenance force him to abandon his server. Another consideration is Windows Server 2003 end of life that will happen on July 14, 2015. While newer version need more requirement that mean more money when you deploy newer Windows server. Yes, according to Microsoft Technet the requirement for Windows 2003 server is quite low (x86 based computer need 256 MB recommended minimum and 512 MB minimum for x64 based computer). I think that the only consideration why many forex vps provider out there still deploy this version. I used to use CentOS for linux based server, second option is Ubuntu server. Both option taken with consideration about their support. CentOS is free and always came out after Linux Redhat. Ubuntu also free and have their LTS policy that make feel confident deploying it to my server. The problem with CentOS is me actually. I must wait for long time till I get it released but it’s worth. Today, my friend who study in Europe ask me about Oracle Linux. I never know about it and I feel curious. Beside official support of software that required specific OS like HHVM that support Ubuntu server that make me choose Ubuntu server for smooth installation of HHVM then I’ll use CentOS first. Same principle applied for Oracle Linux. Since Oracle own this OS then I think they have great support related to their product such Oracle database. Other sight I get from their release is not long after Linux Redhat released I see it (Oracle Linux) also come with their version. In this post I’ll explore how to install oracle linux in vps using custom iso. Oracle linux version 6.6 that released on Oct 21 2014. I use vultr for this post. They provide custom iso facility that enable me for use iso link. Using oracle linux iso file from here and upload it to Vultr. 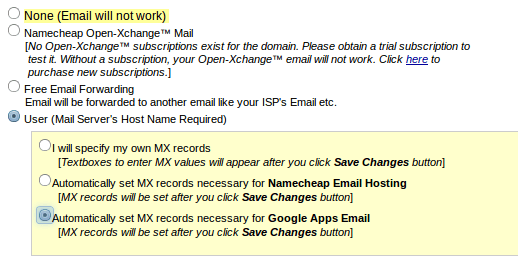 Pick “User” and Choose “automatically set MX records necessary for Google Apps Email. Click Save changes one more time. At this time namecheap will update mx record and user can relax now. Waiting for propagation time (maximum 3 x 24 hours). You also able to verify setting by using intodns service. Enter domain name and click report button. Pay attention for result, specially on MX section. If you also see like this one then everything is fine. Another work to do after this work is pointing A record to my vps for temporary service. Another theme is need to fix after emphaino case. This time hatom error came to live-wire theme. 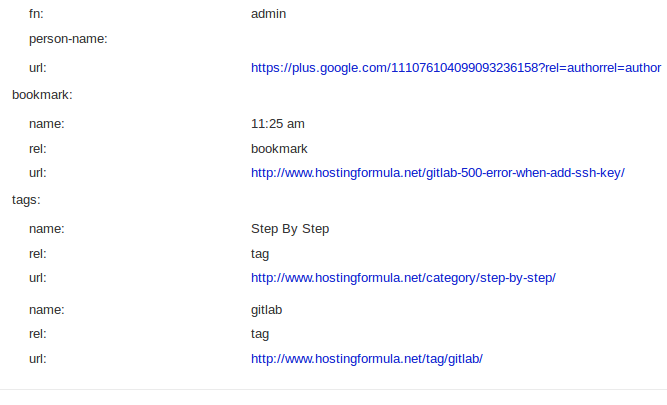 Testing again via google webmaster snippet tools and voila, everything fine now. I used to visit google webmaster tools for checking error related to my blog. Update new theme, changing hosting, domain propagation sometime went bad after sometime. Google webmaster tools is my friend to detect such error. When I log in to google webmaster tools I found “exclamation mark” next to “search appearance” of this domain. Further click lead me to structured data error. Wow, 191 item with error. Click the number give me ore detail error about blog post that affected with that error. 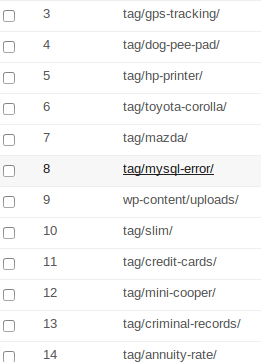 Further check using richsnippets tools give me exact error. Its seem that I only need to fix ‘updated’ error section. Raymondware give great explanation about other error that might encounter. By default you need to look for single.php and see the content. Looking for ‘date’ section and wrap it with class “post-date-updated”. Unfortunately in my case ( I use Emphaino theme) I must digging more to find relevant php file that contain the target. 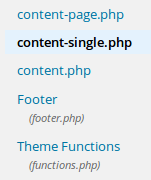 Its in ‘content-single.php”. Save and retry look it up from richsnippet tools. Those 3 factors combined together and lead to ‘unstable’ self hosting wordpress. Newest wordpress offer automatic upgrade for the version but you must do the rest (upgrading theme and plugins). 1. Database name : enter your blog name as component. ex, if your blog is about flower then fill flowerdb or mydbflower. It will save you from headache in the future. 2. Table prefix : enter shortname of your blog, ex: flo_ . Don’t use wp_ . 3. Use strong password. You can click ‘key’ icon next to admin password input. 4. Use advanced option. Make sure to check 3 options (auto upgrade, auto upgrade wordpress plugin and auto upgrade wordpress theme). Using that setting will give you ‘health’ wordpress that give you long run blogging platform without worrying about late update action. I’ll create separate post to explain it in step by step mode. My friend who ask for email problem send me another email. He told me that he already move his gitlab server to another because he see better offer (cheaper vps with better feature). The transfer job taken by his co worker that taking vacation now. The problem is simple . Update : the title no longer valid since Vultr lowering the price in half. Yes, for 2GB memory you’ll need $10/month plan. After I help my friend set spf record for his gitlab I got email from a friend who has a computer course. His student around 400 and he want to give ‘collaboration’ feel to their programming curriculum. He ask me to help him install gitlab with $20 $10 budget. Due to distance problem I decide to use vps from vultr than using his server. (Actuallly the server is connected to internet using adsl and only fast access via lan connnection that make me worry about the performance.). Storage : > 20 GB and SSD preferred. Latency : closest one to my country (check via ping, the lower respond than the connectivity is great). Based on that requirement I choose $15 $10 package from vultr. This is a long time draft that I thought already publish till I update some wordpress plugin. My friend who open software house came send me private message. He ask me if I have an idea why his email not delivered. 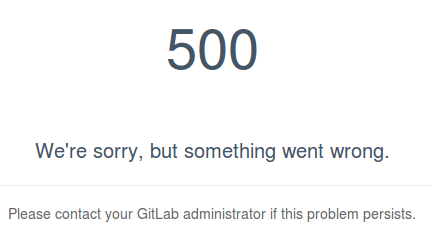 He install a software called gitlab. This software basically manage operation of git from web based application. After few minutes (almost one hour) ticket responded and port unblocked. Now I see email arrive to mailbox. I got memory 2GB and also 2GB for swap. Means I have 11GB space. Bigger result with short time mean better HD. Mean swap enable on my vps. Install slackware in a vps is assignment I create for student. The challenge is rather different than install others (BSD or Linux distro) operating system. Yes, create partition is a must in this work. If Ubuntu or CentOS or OpenSUSE provide easy way to create partition then Slackware is strict. The minimal solution is still the same. Create swap and native but you must use command line tools like cfdisk or fdisk. One of my student admire if he did different way to accomplish the job. He use Gparted to create the partition followed by Slackware installation. I think his way might be useful for others who want to achieve the same target : install slackware in vps. So, here the steps I try to recreate for that aim. I use vps provider that let me use custom iso like Vultr. After login then click ‘My ISO’ to upload the iso. I use Gparted from Jaist mirror. For Gparted 0.20.0-2 iso file (x64) click here. I also use Slackware 14.1 iso from Slackware mirror. Both of iso use 64 bit version. Enter location of iso file then upload. My friend send email asking for command line. His boss don’t believe on uptime report he made. He told me that he got the report from 3rd party that manage the server. He want to know it and will show the result to his boss. As usual for more detail or option available using man. uptime – Tell how long the system has been running. rently logged on, and the system load averages for the past 1, 5, and 15 minutes. uptime was written by Larry Greenfield <[email protected]> and Michael K. Johnson <[email protected]>. If you want to print it you might want to export it first. If you have vps or dedicated server then you can compare it versus confirmation email from provider. Today, my class will be discuss on how to install Zimbra Collaboration Suite. One of my student want to try it using different OS. As we don’t have access for Linux Suse Enterrprise Server 11 then we’ll try it on OpenSuse 13.1 . I never try it beside using Ubuntu but it won’t hurt right 🙂 . VPS is ready for such action. Distrowatch told me about newest version of DragonFlyBSD (3.8.0) . This version also in my waiting list as I know this BSD variant since beginning. When DragonFlyBSD begin using ports aka dports to their software installation management then I’m happily use this version as server. For documentation process when I delegate installation process for my staff I create this simple guide. DragonFlyBSD provide .iso.bz2 link and I have to convert it to .iso first. The idea is create temporary location for iso file and use it for Vultr custom iso. I think my lowendspririt vps is good place to hold temporary image. Connecting to avalon.dragonflybsd.org (avalon.dragonflybsd.org)|2001:470:1:43b:1::72|:80… connected. Today I got “error, can not write” message on the bottom of my blog. I think its temporary since I often see the message before (with bluehost). My VPS utilize 100% of / partition (I thought soft limit is there) and lead me to error message. I forgot if this VPS use two drive : /dev/vda1 for operating system and /dev/vdb1 for data storage. Hacked wordpress is pain but after get it restored you must cleanup manually a few aspects for optimum performance. To make sure you follow Google rules you can use Google webmaster tools to detect the mess. Google Bot will tell error they found during scanning process. Soft 404 mean Google think its not exist but its do exist. As you see from the picture. WordPress tags put ‘un relevant’ content for your blog. 3. Check the box and delete un related tags manually. Some links might respond slow then Google bot think it doesn’t exist. Check it manually by visit the link and click “mask as fixed” when you’re done.